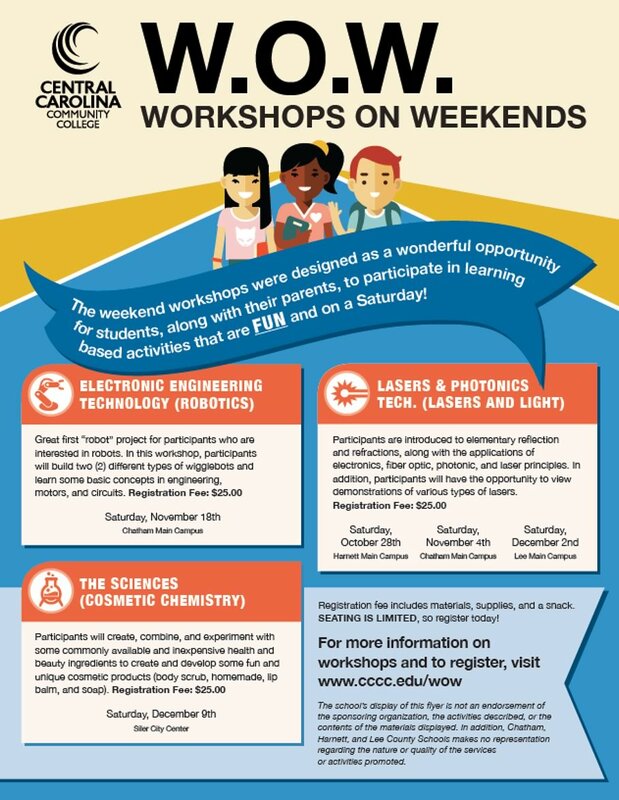 SANFORD - Central Carolina Community College is offering Workshops On Weekends this fall. The weekend workshops were designed as a wonderful opportunity for students, along with their parents, to participate in learning-based activities that are fun and on a Saturday. Electronic Engineering Technology (Robotics): Great first "robot" project for participants who are interested in robots. In this workshop, participants will build two different types of wigglebots and learn some basic concepts in engineering, motors, and circuits. This workshop will be offered Saturday, Nov. 18, at the CCCC Chatham Main Campus in Pittsboro. Lasers & Photonics Technology (Lasers and Light): Participants are introduced to elementary reflection and refractions, along with the applications of electronics, fiber optic, photonic, and laser principles. In addition, participants will have the opportunity to view demonstrations of various types of lasers. This workshop will be offered Saturday, Oct. 28, at the CCCC Harnett Main Campus in Lillington; Saturday, Nov. 4, at the CCCC Chatham Main Campus in Pittsboro; and Saturday, Dec. 2, at the CCCC Lee Main Campus in Sanford. The Sciences (Cosmetic Chemistry): Participants will create, combine, and experiment with some commonly available and inexpensive health and beauty ingredients to create and develop some fun and unique cosmetic products (body scrub, homemade lip balm, and soap). This workshop will be offered Saturday, Dec. 9, at the CCCC Siler City Center. The registration fee for each of these workshops is $25, which includes materials, supplies, and a snack. Seating is limited for each workshop. The workshops are held from 9 a.m. to noon, with sign-ins beginning at 8:45 a.m.